When you “Safe down” a VOLT make sure you tape a cardboard shield over the “Power Button” before you remove the Orange Safety Plug or disconnect the 12 volt battery (in the hatch area floor). Why you ask? If you push the “Power Button” while the “Safety Plug” is out the onboard computer sees this as a procedure that may harm you. The HPCM and HPCM2 computers will be taken off the CAN bus and not allowed to communicate with the rest of the system. You are locked out for being unsafe. At “Up Your Voltage” in May of 2011 the class and ACDC learned this valuable lesson. 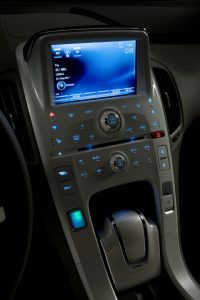 The GM engineers have designed their software to keep anyone that starts to work on a GM hybrid or EV safe. Here is their thinking. 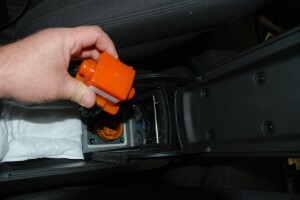 If you do something that the onboard computer sees as a procedure that may harm you by allowing high voltage to go to a part of the car you may touch, the HV Battery computers (two) will be taken off the CAN bus and not allowed to communicate with the rest of the system. You are locked out. So, it is important to know two things; how to be safe and what NOT to do so the computers do not give you an “F” on your report card. If this happens you will need a factory scan tool (GDS) and help. Just don’t screw up is the best advice.